The public will have another opportunity to weigh in on the proposed renovation of Ziegler Park on July 23. This will be the third in a series of meetings focusing on the renovation and potential expansion of the park, which is located at the northwest corner of Thirteenth and Sycamore streets. The community input session will be held at the Woodward Theater, located at 1404 Main Street in Over-the-Rhine, at 5pm on Thursday. Concept D was an earlier proposal for the park presented at previous community input sessions. The 1.4-acre park currently contains a pool, playground area, and shelter with picnic tables. To its east sits Cutter Playground and the former School for the Creative and Performing Arts building, which is being converted into a 142-apartment development called Alumni Lofts. Then, to the north, is a large parking lot, with a basketball court located just across Thirteenth Street to the south. 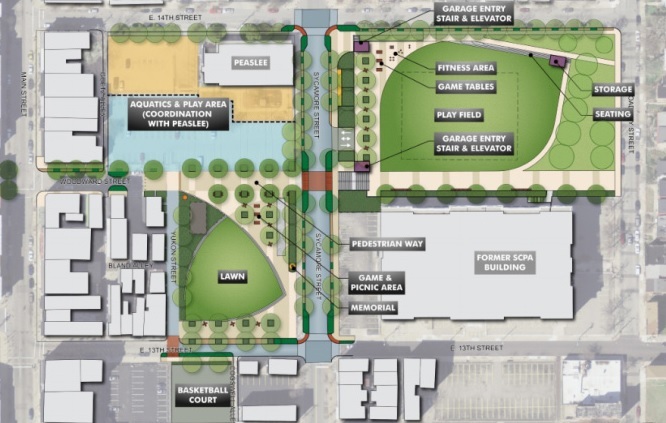 The latest proposal for the park was presented in late June at the launch of the Citizens for Cincinnati Parks levy campaign. The plan, said to cost $5 million, depicted the current Ziegler Park site renovated into a large, open lawn space, with the removal of the existing pool; and the parking lot to the north being removed and converted to an aquatics and play area. A parking garage would be built under Cutter Playground, serving both the residents of Alumni Lofts and visitors to the park and surrounding area. Several enhancements along Sycamore Street would make it easier for pedestrians to cross between Ziegler Park and Cutter Playground. After gathering feedback, organizers say they will prepare a preliminary master plan that will be presented at a fourth community input session. From that, the final master plan will then be developed.